THE WRITING BUDDHA - Opinions | Books | Movies: The Sialkot Saga by Ashwin Sanghi (Book Review: 4.75*/5) !!! The Sialkot Saga by Ashwin Sanghi (Book Review: 4.75*/5) !!! There are only few sensible fiction authors in India whom you can name whenever people are ridiculing you over the fact that you do not read foreign authors. The first three names that can save you from humiliation are Amish Tripathi, Ravi Subramanian and Ashwin Sanghi. The eager wait for each of their book cannot be described in words. 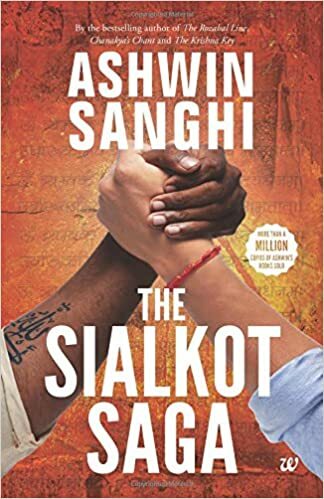 I am just done reading Ashwin Sanghi’s latest release, “The Sialkot Saga” which is almost 600 pages and I am glad that it has turned out to be the book worth waiting for. As obvious, right from the first page, this book attracts you towards itself and doesn’t let you think about anything else until and unless you are done with its last page. Unfortunately, I have not been able to complete this book in a single sitting but I would like to say even when I took break while reading this book, I didn’t forget name of a single character. That’s how much interesting every character in this book are even when they have a small role to play. Once again, Ashwin Sanghi have chosen to tell two stories- one based in history and another one between the year ranges of 1947-2010. This time, he has chosen to go Jeffrey Archer way than Dan Brown and he seems to have succeeded in it undoubtedly. Though, there’s nothing like suspense for which you’ll keep on turning the pages but the narration of the story is done so splendidly that you will find it hard to keep the book aside. The real incidents are used to build up the premises which is the USP of this book. Even the real characters like Atal Bihari Vajpayee are used to make the story look more significant. The book consists of all the dramas- business, competition, politics, wars, partition, Bollywood, sports, underworld, family, science, history, crime, etc. Like the Bollywood movie “Mausam”, author have set many of his sub-plots with some real tragic incidents such as Godhra incident, 9/11, 26/11 etc. Thankfully, he manages to handle it with his wit and creative writing skills. The kind of research and study that Ashwin Sanghi must have gone for writing this book can be easily deciphered in every 10 pages. The last few pages reflects how he challenges himself to write something that people won’t even expect from him. And this acts as an added value for the reader. Coming to few drawbacks, I feel that the title of the book didn’t do much justice as Sialkot have very less to do with the story. Similarly, I feel that few pages could have been edited as they didn’t provide much boost to the story. Again, the usage of real-life characters aren’t used but kept as cameos in book. They should have been used somewhere in an important junction of the story which could have added more power to it. Anyways, this is a book which shall always stay in my Recommended List as it has everything which a reader dreams from a new book. I give this book undisputed 4.75* out of 5.